Use the break-in function to get inside the bank! Open the safe to steal the LEGO® money! Released in December 2011, this set was one of the first in the new Super Heroes wave, which would encompass both DC and Marvel Universes. First impressions of this set were that it did look impressive with an array of playability features, vehicles and minifigures. Those familiar with the 7781 release immediately noticed the change in Two Face's vehicle from an armoured car to a truck and winch in this set. The Batmobile is also rather different, looking a bit chunkier around the front as opposed to the sleek, curved exterior of its predecessor, yet it still has significant "cool factor". The colour design of Two-Face has changed from the black and white to more garish purple and orange, and finally the addition of a bank vault to rob adds extra playability to the set. A Batmobile, a multi-coloured truck and a bank vault makes this set appealing to most people. First of all, let us look at the minifigures available in this set. This Two-Face minifigure is exclusive to this set and is unavailable in any other. This Batman minifigure variation is available in this set and the 6863 Batwing Battle Over Gotham City set. This Two-Face Henchman minifigure is exclusive to this set and is unavailable in any other. This Two-Face Henchman (with sunglasses) minifigure is exclusive to this set and is unavailable in any other. This Guard minifigure is available in this set and the 10937 Batman: Arkham Asylum Breakout set. So for our value for money, we receive 3 exclusive minifigures whilst two others only being available in one other set. Whilst I like the look of the exclusive figures I do prefer the look of the original Two-Face in the previous wave of Batman sets. Still, at least they stand out! The range of colours in this set is certainly a highlight to go with the minifigures, providing us with a variety of pieces in black, tan, bright orange, bright red, bright yellow, dark green, dark stone grey, medium lilac and medium stone grey. Onto the build itself, the set is divided into three sections; the Batmobile, Two-Face's truck and the bank. The first book of instructions focuses solely on the Batmobile and Batman, using the first 2 bags. The Batmobile is a very straight forward build. I would have liked to see a slightly more sleeker design over the wheel arches, but that is being picky. The Batmobile can unleash flick-fire miss near the rear tail fins. I must confess to also like the previous fire function from the front nose cone in the previous rendition of this set. That being said, the design of this still looks impressive and being a vehicle (let alone a Batmobile!) keeps the playability high. The second book of instructions focuses on the building of Two-Face's truck and the bank. Bag 3 opens up giving us Two-Face, his henchmen and his truck. This truck is rather unique in that it is divided into two colours, symbolising Two-Face's conflicting personalities. It again is not a difficult build, and the repetition is numbed by the colour variation. The truck possesses a pair of flick fire missiles on one side and a gatling gun on the other. The truck also possesses a crane used for robbing the bank! Plenty of playability in this one! The third and final bag in this set is to complete the bank. After building the guard, we work on the exterior of the bank; working on the sides and the front (the rest remains open for playability). A small lever is created in order to pop out the windows. I will confess, I hate putting clear stickers on windows. It is a personal pet hate with Lego so I was not too impressed with the dollar sign stickers to go on the windows here. The building could have been developed further with a bit more detailed as it does seem a bit rushed. That being said, it isn't the focus of the set and in reality was only used to add a bit more playability and bump up the price. Going by the sold listings, the three minifigures total $35.53, with the current asking prices totalling $42.89. When we consider full retail price for this set is $49.99, there is a decent gap between this and the sold minifigure prices. 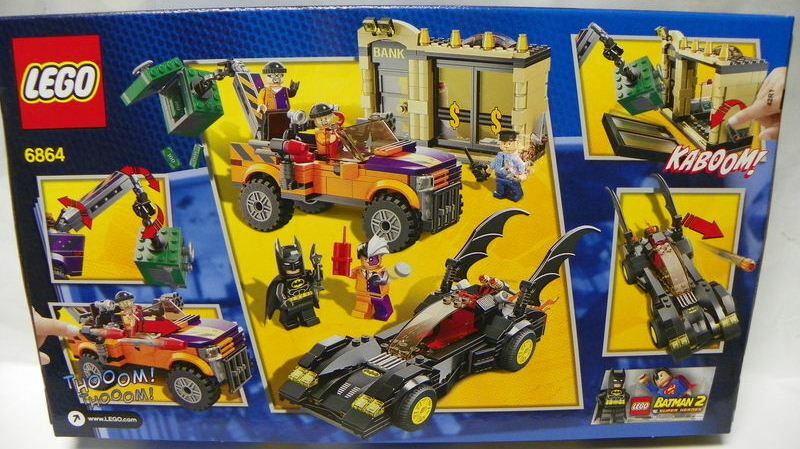 The main value here lies in the Batman and Two-Face minifigures, with the extras not being as sought after as say the Joker Henchman in the 6863 Batwing Battle Over Gotham City Set, which sells for close to $8. That being said, with minifigures already account for a 70% minimum return on an open set, the investment future for the set remains positive. After browsing these comparisons we can conclude that compared to other larger sets in the Super Hero line, the 6864 set gives a very decent return in our price per piece ratios. It contains 5 minifigures with two being extremely popular and you get a better brick return for the full retail price. Between DC and Marvel, Lego has thus far issued 29 sets under the Super Heroes line, polybags excluded. Of this, 15 sets are based on DC characters leaving 14 from the Marvel Universe. Breaking the DC sets down further, there are 10 Batman-centric sets, 4 Superman (3 Man of Steel, 1 Justice League) and 1 set based on the Green Lantern maxi build. 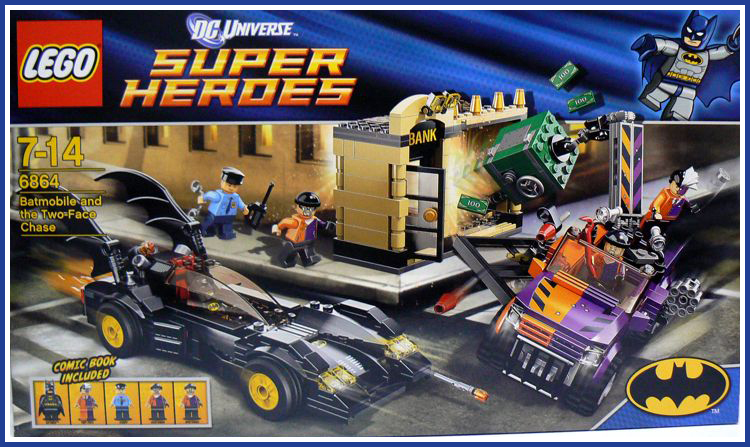 To go with this, Lego previously issued 13 sets under the previous Batman line. If we look at the most recent Batman trilogy released cinematically, it shows how truly popular Batman is. The three movies combined grossed nearly $2.5 billion with the last 2 movies currently sitting within the top 20 highest grossing films of all time worldwide. Finally, we can see something else that will ensure this theme will remain popular with investors.... the previous rendition. The Lego Batman theme from 2006-2008 has a CAGR of 32.33%, a whopping return. Whilst it is unlikely this release will match that one, investors will be inspired by its returns, hoping for more. This set was released in December 2011 and is still currently available. It was available in many stores and easily accessible to consumers and being a mid-range set with Batmobile, truck, banks and 5 minifigures it would remain appealing. The box art is fairly neat with the vehicles prominently displayed as the minifigures interact with them. The Batmobile certainly stands out, being the main drawing point to this set. The back is well laid out, similar to a comic, whilst detailing the features both vehicles have. The box itself seems thinner than other sets, though this may be due to the large amount of space inside. It did feel more flimsy though, with quite a large amount of unused space inside the box. Thus far the set is not doing too badly, considering it is still readily available. Yet we must also consider the CAGR of the previous 7781 rendition (30.46%), the 7784 UCS Batmobile (17.45%) as well as the current CAGR of this Super Heroes theme (21.63%) and the previous Batman theme (34.74%); all very healthy returns. The CAGR of the Super Hero theme is 21.63%, above the current 10.49% Lego average. Lego has also made a point throughout this entire Super Hero theme (between both Marvel and DC) of not only spreading characters out through their sets, but also giving many variation prints making them exclusive to particular sets. Batman, Joker, Riddler and Harley Quinn all have multiple variations yet to this point this is the only Two Face set. The previous Batman theme only had Two-Face available in only one set as well. This can only enhance a set's value as figures retain their value by remaining exclusive and not able to be picked up in every set. Will this set appreciate after going EOL? Absolutely! Batmobile sets have proven to increase nicely in value, and the potential exclusivity of Two-Face doesn't hurt. The set certainly stands out and will inspire conversation amongst children and Lego enthusiasts. The Batmobile is iconic and simply attracts attentions whilst the vibrant colours of the Two-Face truck are very bold and eye catching. The banks itself is rather plain though the neutral colour does look good when balancing in with the other two vehicles. Throw on top of this impressive minifigures and we have a set that looks nice and certainly grabs attention. Batman is a universally loved character in the DC Universe. Lego had great success with the previous theme with the secondary market pushing prices to almost obscene levels. Bringing Batman back into the Lego fold was a no-brainer for the company. Fans eagerly anticipated the return of the Caped Crusader and haven't been disappointed. Whilst some sets are remakes, the Batman theme pushes the Super Heroes line with more sets than any other character. This set contains five minifigures and two excellent vehicles. The Batman and Two-Face minifigures are excellent, whilst the remaining three are good to average. The Guard is disappointing and seems too generic and just thrown in, whilst the Henchmen look good but lack the appeal of the Joker's henchmen in the 6863 set. The set gives a nice return thus far compared to other sets, with the minifigures making up the majority of the set's value though the Batmobile will always sell well regardless. Considering how the previous theme and Batmobiles increased in value, I believe putting some of these aside is certainly a wise idea.